A while ago on a quest to the vision realm I found myself back at the Sacred Fire Circle. It seemed natural to be there. 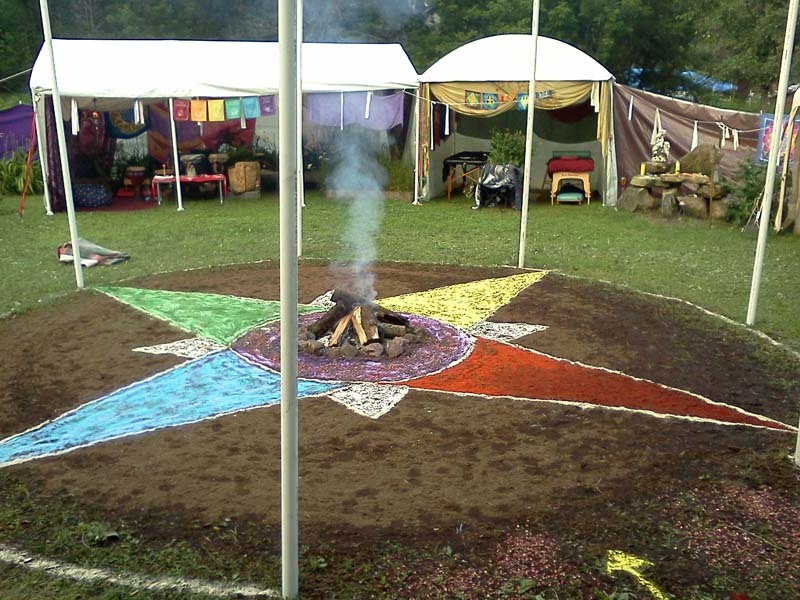 Sacred Fire Circle in Paradise is more a part of the vision realm then it is of normal reality. We are surrounded by darkness in a place of light which we created as a contained sacred space. We enter intentionally. We work intentionally. We spend night after night with focus in a ritual environment. The sacred circle takes place from midnight until dawn for three nights. Every night, many people experienced divine possession, especially whilst dancing, but also whilst drumming, singing, healing, meditating, or other activities. The place just lends itself to it. Every religious path has some tradition of ecstatic connection to the divine and SFCiP is a place to experience it. It is deeply experiential. Even without the connection to the divine, the experience is still powerful. The combination of all things, the drumming, the dancing, the holding of space, the singing, the mindful intention, all of it creates an environment which is conducive to profound experiences. This was the third year of this fire circle, and it had 36 participants, the largest yet. Through the generosity of a scholarship donations program, 6 people were assisted in being there. This year, the capital expenses of creating a new circle were covered, so next year more can be dedicated to the scholarship program. The site can accommodate up to 50. Those who could arrived a day early for what is called Early Village Building. This was when most of the structures were erected which would define the outer circle of the sacred circle. 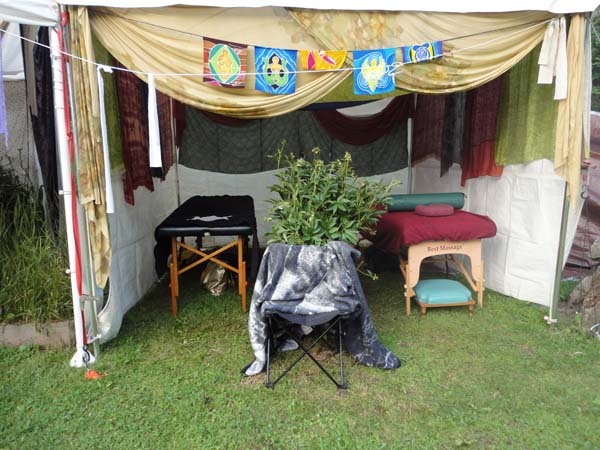 There were structures for sheltering musical instruments, healing, meditation, food, nesting and transformation. All the structures were used throughout the nights for the enhancement of the experience. The structures defined the outer circle, but there was also an inner circle around the fire defined by a circle of tikis, raised ten feet in the air atop white PVC poles. This inner circle was where most of the dancing would take place, and was the energetic focus of the evening. The tikis were filled. Kindling was gathered. Wood was stacked. The wards were refreshed around the property. Offerings were made. Those who were there for the Early Village Building had a small informal fire in the newly created space that night where we fired the beads which were crafted for participants to wear throughout the event. The next day was dedicated to decorating the circle, and preparing for the first night. Water was hauled to the circle. Food was prepared. A rangoli was created around the fire. The space was crafted with care. And most importantly, most of the participants arrived. After dinner we all gathered together for the first time for orientation. We all gathered in a circle, many of us meeting for the first time, and establishing the connections and understanding of each other which would be built on for the next three nights as we work together and trust each other. Then we napped in preparation for the night. Napping is also an important part f the experience. It creates a separation between the day and the night. Even if we aren’t able to sleep, there is an expectation that people will be quiet. At around midnight, we processed to the circle. We processed in darkness into darkness. Then, together we lit the candles on the alters. We lit the tikis. And we lit the main fire. We were able to witness together as the circle of light emerged from the darkness. The first night tends to be mostly dedicated to burning away the dross, so that we are more able to fully immerse ourselves in the process. We howled at the full moon. We drummed. We danced. We sang. We played singing bowls. We offered healing. We allowed ourselves to seek healing. We utilized and experienced the space. Morning came, and with the first chirping of the birds, we began to release from the seriousness of the night. Songs shifted to theme songs, and pop songs. People laughed more. It was all given to the fire and burned off, preparing us for further immersion the next night. We ate breakfast, we slept, and while we slept, it rained. It was a perfect rain. It created the perfect white noise for the perfect sleep. The next day we refilled tikis, hauled more water, stacked more wood, created a new rangoli around the fire, and generally prepared for another night. We also had some workshops, swam in the creek, chatted with new and old friends, and experienced each other. Again we slept, and processed to the circle. It had rained and there was rain in the forecast. The universe gave us water, and so upon entering the circle, we were blessed with water. The evening was dedicated to the element of water and all it symbolizes. We embraced where we were and what we were offered. Again we drummed. We danced. We sang. We played singing bowls. We offered healing. We allowed ourselves to seek healing. We utilized and experienced the space. Just as the birds were beginning to herald the coming of a new day, the rain began. This was not a light rain. 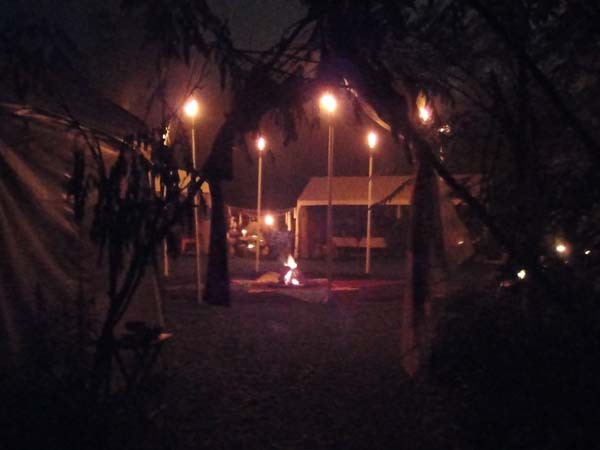 This was a torrential downpour, and yet just about all of the participants stayed in the sacred space until the night was over, and several stayed in the inner circle around the fire. The rain continued, creating yet more perfect white noise for perfect sleep. The next day, the circle was dried out, and preparations were made for the last night. Another rangoli was created. We had some workshops, swam in the creek, chatted with new and old friends, and experienced each other. We slept. We processed. We entered the circle under a clear sky with the full moon shinning down upon us. It was a perfectly night. By this point, we all seemed prepared to embrace and utilize it, and we did. At the end of this evening, there was very little silliness. We were completely immersed and completely present. The circle closed with participants taking a moment to one by one look at each other honestly and openly. We then tore down the circle. The decorations were removed, the structures were broken down, everything was hauled away and packed for next time. Before coming, people would hear about where I was going and say, ‘Well, have fun.” I did have fun, but this experience was far beyond fun. This was the deep spiritual connection that people of all paths seek. Because of the serious nature of the work, this event is only for people over 18. This is not a place for children to play. This is a place for grown-ups to grow. Sacred Fire Circle in Paradise is the event that I look forward to all year-long, and can’t imagine ever missing. *Editor’s Note: Nels Linde, PNC-MN Co-Editor, is co-host of the Sacred Fire Circle in Paradise . 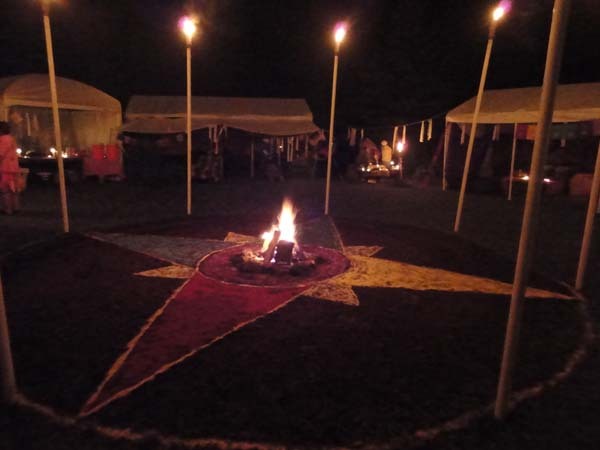 On July 24th the Sacred Fire Circle in Paradise donated 25% of its net proceeds to the Sacred Path Center’s ‘Change and Grow’ fund raising effort. 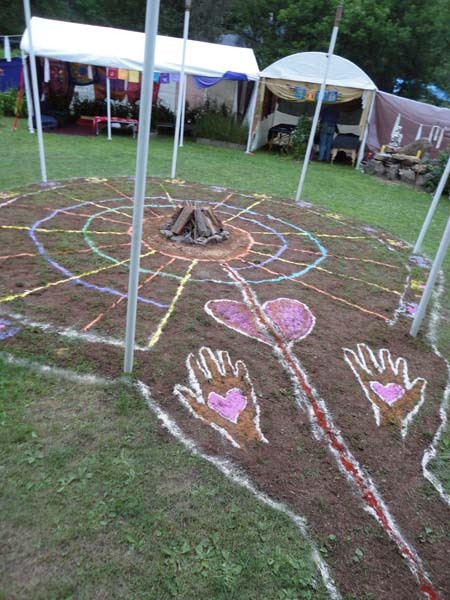 Another regional Sacred Fire Circle takes place at Circle Sanctuary, this Labor Day Weekend. 25% donation to sacred path center!!!! NICE. Lovely article and the description of the weekend was “spot-on” thanks to all who offered snippets and insights.